We posted this on our Facebook page and on Twitter when we learned about it, so apologies to our friends there who have already seen it. However, we didn’t want to omit our friends on the blog, so we’re providing the information (and a bit more detail) here, as well. 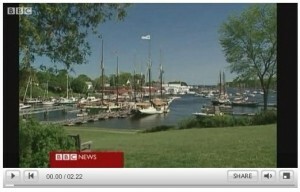 The short version of the stoy is that BBC News did a short spot on tourism in Maine. Much of it was filmed at Brewster House, and Scott appears, talking about the coming season. The video can be seen on the BBC web site. There is, of course, a bit more background. We were contacted by Greg Dugal of Maine Innkeepers Association, who is interviewed on the segment, asking if we would like to talk with BBC News about such a story. Of course we were interested, and spoke with the producer by phone. They also asked how we were attempting to increase interest and attract guests, and we told them about our packages with Portland Schooner Co. They loved that idea, so they also contacted them about the video. A few days later the BBC News crew arrived, cameraman, producer and on-air personality Philippa Thomas (we’re not related, as far as we know). They were all delightful and professional. First they filmed an interview on our guest porch with Greg Dugal, who gave them quite a lot of information on Maine and the outlook for tourism. Unfortunately, they only used a small portion of that interview. Then they came inside, and filmed Scott with Philippa Thomas walking through the ground floor rooms and discussing the house, the business climate, etc. Again, only a small amount was used in the clip. Next they were off to Camden to film the harbor (seen in the opening shots), and the next day to film at Portland Schooner. Part of the BBC News objective was to report on the outlook for tourism in the face of a weak economy, so much of the clip sounds discouraging. However, all three of us (Greg Dugal, Scott, and Scott Reischman of Portland Schooner) feel that things are better than portrayed and attempted to say so. Unfortunately not many of those comments made it on the air. The clip aired on Monday evening, June 8, 2009, but unfortunately they forgot to notify us (as they had planned to do), so we didn’t see the clip until the next day when they informed us of the location on the BBC web site. We hope to obtain a DVD of the full interviews, so we can see how the entire thing came out.